New times require new narratives; and Leadership is no exception. My book, “Awakening A Leader’s Soul: Learnings Through Immortal Poems,” presents a new human-centric leadership narrative called “Soulful LeadershipTM,” which declares that in today’s complex and uncertain world the humanity of leaders is significantly more important than the brilliance of their executive minds. The dilemmas, quandaries, and problems faced by today’s leaders can’t be solved by simple-minded thinking: “yes-no,” “right-wrong,” “agree-disagree.” There’s always a “but…” hanging around somewhere to make leadership journeys and decisions more challenging: “Yes…but,” “Right…but,” “Agree…but.” Consequently, what is needed is bold, audacious leaps away from traditional methods of developing leaders that rely on personality-based approaches and effective execution of virtuous managerial tasks, like empowerment, job-enrichment, and having fun at work, to something deeper, more substantial, and more enduring. We need an inner awakening in leaders, so that they can bring their biggest asset into play, their humanity—who they are, what they stand for, and what they are willing to fight for. Because, while the head may be smart, the soul is smarter…and wise. When contexts and circumstances surrounding us change, extending the tyranny of dead ideas, or wrapping them in shiny new packaging, rarely works; new times require new narratives. We need bold new ideas to reimagine and repurpose the vital institutions of our times that have the potential of creating (or destroying) wellbeing and prosperity for the greatest many. And leadership is one of them. I sincerely hope you’ll buy a copy of my book and learn more and read more about how “Soulful LeadershipTM” enables leaders to elevate their game. To buy the book click here. However, if you’d like to sample an essay from the book before buying it, please click here to access the Prologue, which is the first essay of the book. Look forward to connecting with you in future blogs. Meanwhile, hope you will embrace the ideas and practices of “Soulful LeadershipTM” shared here and in the book, and share your ideas, views, and opinions on how Soulful LeadershipTM can make the world a better place…for the greatest many, including planet earth…and not just for the privileged few with access to power and resources. 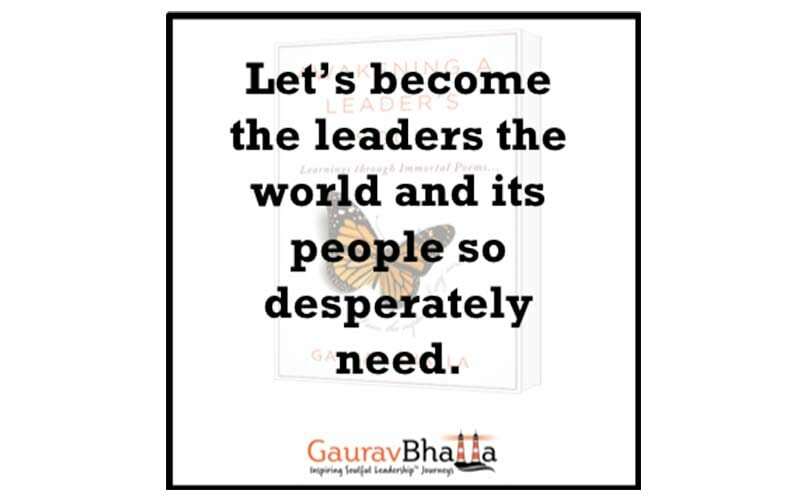 Let’s become the leaders the world and its people so desperately need.